University of Seoul architecture students and design firm UTAA have transformed a parking lot into a cool and contemporary public space. 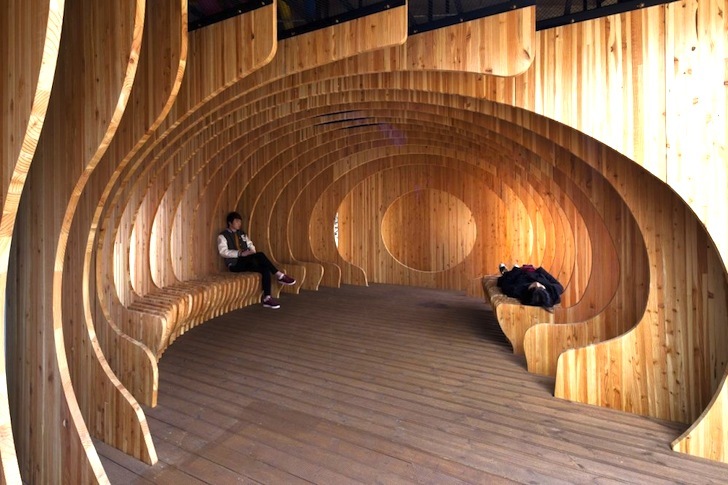 Titled the Rest Hole, the ribbed structure has curved wooden panels that form sinuous seating and frame an undulating organically inspired space. Each wooden rib is spaced out to allow light and sound to permeate the structure and fortify the concepts of spaciousness and flexibility. Located on the first floor of a student dormitory, the former parking lot was once a dark and underused space only frequented for smoke breaks and bicycle parking. The university sought to hollow out the parking lot into a modern rest area for students. The resulting organic shape adds a warm contrast to the harsh angles of the surrounding university buildings. Lit by bright ceiling lights and natural light, each wooden rib was designed with a unique shape that when put together, creates a sense of rhythmic, undulating movement. 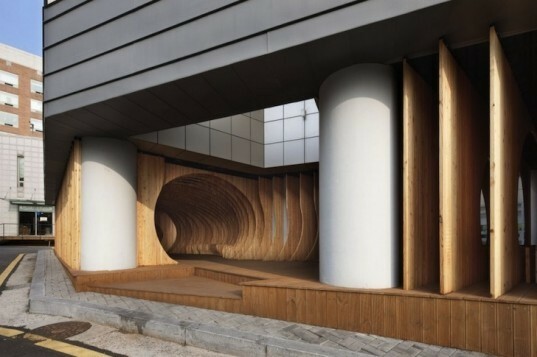 The shape and spacing of Rest Hole’s wooden ribs were also dictated by a prerequisite to hide the large supporting columns that created an “unpleasant heavy feeling.” In addition to the ribbed wooden benches, the rippling public space also accommodates extra wooden seating and tables. Located on the first floor of a student dormitory, the former parking lot was once a dark and underused space only frequented for smoke breaks and bicycle parking. The university sought to hollow out the parking lot into a modern rest area for students. The resulting organic shape adds a warm contrast to the harsh angles of the surrounding university buildings. Lit by bright ceiling lights and natural light, each wooden rib was designed with a unique shape that when put together creates a sense of rhythmic, undulating movement. The shape and spacing of Rest Hole's wooden ribs were also dictated by a prerequisite to hide the large supporting columns that added an "unpleasant heavy feeling." In addition to the ribbed wooden benches, the rippling public space also accommodates extra wooden seating and tables.